It was starting to get dark and I was fishing at Cabwaylingo Park. I decided to stay a little while longer even though my friends left. As I cast my line into the water I felt something blow my hat. I thought the wind had picked up but as I looked up at the sky, I saw nothing moving. I went about my business and fifteen minutes passed and it happened again. 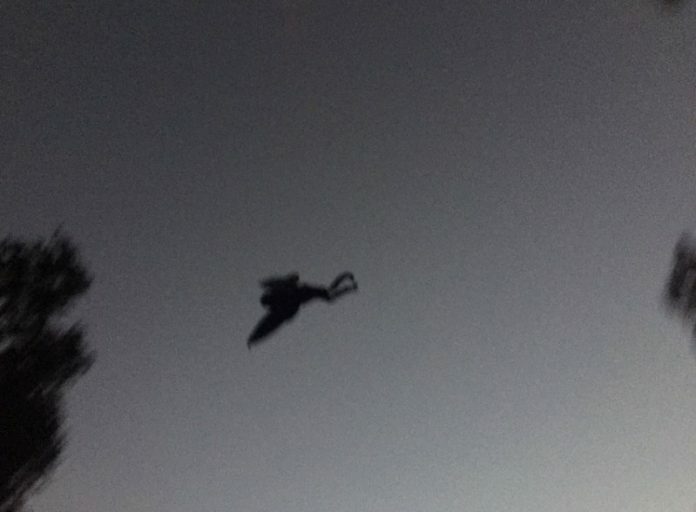 I looked up to see some black creature with wings, it was almost like a bat but larger and had legs. Of course, I jumped up and ran leaving behind my poles, lunch box, and tackle box. I jumped in my truck and left. Of course, my sister thought I was drinking so I never told anyone else. Three nights later, I went back to the creek bank to that same spot and watched in my car but I never saw anything. This really spooked me. I swear I wasn’t drinking or smoking. I Hope to never see it again!! !